Entire Board Of USA Gymnastics To Resign : The Torch USA Gymnastics said it "completely embraces the requirements" set by the U.S. Olympic Committee. Sexual abuser and former team doctor Larry Nassar was sentenced to up to 175 years in prison this week. The entire USA Gymnastics board will resign, the group says. 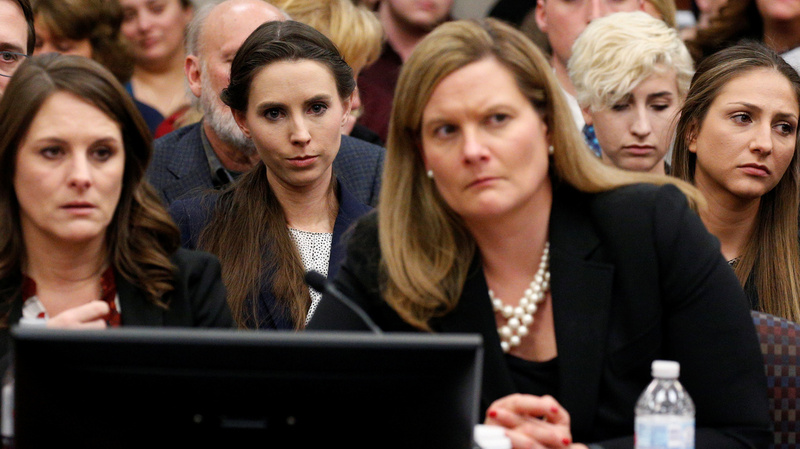 Rachael Denhollander (center) listens as Larry Nassar, a former team USA Gymnastics doctor, was sentenced to up to 175 years in prison for sexual abuse over decades of his involvement with the program. The board of USA Gymnastics says its remaining members will resign in response to a request by the U.S. Olympic Committee. The U.S. Olympic Committee had earlier set a deadline of Jan. 31 for their resignation, or USA Gymnastics would face the loss of its certification as a national governing body. The deadline was one week from the day disgraced team doctor Larry Nassar was sentenced to up to 175 years in prison for abusing more than 150 gymnasts. In response, USA Gymnastics said it "completely embraces the requirements" set by the USOC late Thursday. The entire board's resignation is the top item on a list of mandatory changes that the USOC sent to USA Gymnastics on Thursday. On Friday, USA Gymnastics confirmed that the board will resign. Informing USA Gymnastics of the required resignations, USOC CEO Scott Blackmun cited the "shocking and tragic stories surrounding Larry Nassar's years-long abuse of vulnerable athletes." In the letter he sent to the gymnastics organization, he added, "We must take further action to ensure that it cannot happen again." Both the USOC and USA Gymnastics have faced harsh criticism amid revelations about the systematic abuse that Nassar carried out, with victims and others saying the two organizations didn't do enough to support athletes and prevent abuse. Some of the most powerful criticism has come from decorated gymnast Aly Raisman, who delivered an impact statement at Nassar's sentencing hearing. "The Indy Star story broke on August 4, 2016, after survivors courageously came forward sharing stories of sexual abuse and alleging organizational mishandling," Raisman said via Twitter earlier this week. "The next day, the USOC said they wouldn't investigate (and even praised USAG's work in the area of sexual abuse.)" Raisman also called for accountability. Discussing the army of survivors who spoke out against Nassar in court, she said: "Many of them, myself included, claim the USOC is also at fault. Was the USOC there to 'focus on supporting the brave survivors?' No. Did they issue any statement then? Crickets ..."
The new letter from Blackmun and the USOC details changes that he had outlined in an open letter to all U.S. athletes on the day Nassar was sentenced. In that letter, Blackmun had said the women's and girls' testimony had "framed the tragedy through the eyes of the victims and survivors, and was worse than our own worst fears." "It was powerful because of the strength of the victims, survivors and parents, who so eloquently and forcefully told their stories and so rightfully demanded justice," Blackmun wrote. "The USOC should have been there to hear it in person, and I am deeply sorry that did not happen." Toward the end of his note, Blackmun said that gymnasts who were abused by Nassar may want to ask their doctors "whether to seek tests for STDs or other possible conditions, such as the HPV virus, that could possibly result from sexual assault." Three USA Gymnastics board members resigned at the start of this week: chairman Paul Parilla, vice chairman Jay Binder and treasurer Bitsy Kelley. The organization's president and CEO, Kerry Perry, has been in that job since December. She replaced Steve Penny, who resigned last March. In demanding the board's mass resignation, Blackmun said that he wasn't accusing individual people at USA Gymnastics of wrongdoing, but that the entire board needed to leave as part of wholesale changes. The USOC said that USA Gymnastics should have an interim board in place by the end of February. It's also requiring all staff and board members to undergo SafeSport training — a program that aims to foster safe and respectful environments for athletes and teams and that the USOC has previously used to respond to sexual abuse cases. By invoking SafeSport, the USOC is adding another echo of an earlier sexual abuse scandal, one that centered on USA Swimming. The training program was initially created after reports emerged in 2010 of coaches molesting underage female swimmers, with, as NPR reported, "some of the abuse continuing for years without punishment." SafeSport was mentioned by another Nassar survivor, McKayla Maroney, who filed a complaint against the former doctor, USAG and the USOC last month. In that complaint, she said, "Despite only instituting these SafeSport policies in 2012, Defendant USOC was acutely aware of the ravages of sexual abuse posed to minors in amateur sports, for at least a decade prior to this SafeSport program being created." Maroney, a medalist at the 2012 Summer Games, went public in December, when she said that U.S. gymnastics' governing body had her sign a confidentiality agreement about Nassar one year earlier — months after the case began making headlines with women and girls recounting the abuse they endured. Noting that SafeSport has policies to identify sexual predators' "grooming" behaviors, Maroney said in her lawsuit that the USOC had allowed Nassar to continue to work with minors "and failed to adequately enforce these policies, or mandate that USAG enforce these policies." In its letter to USAG, the U.S. Olympic Committee said that in addition to training and awareness, the gymnastics body must work to reshape itself and change its culture. But some athletes have said the problem extends upward. Maroney said in her suit, "USOC has a culture of ignoring its own internal rules and mandates ... in order to protect its reputation and blind itself to known abusers."